Attach your CLX securely to your CLX Door Anchor making sure your attachment is at knee level. Place your leg inside the easy grip loop, making sure you keep the CLX above the back of your knee. Adjust your body position so there is adequate resistance on your leg. Now bend your knee with the CLX anchored on it forward and then straighten your knee back to starting position. 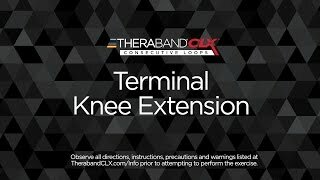 Tip: The resistance of the CLX should be harder when you straighten your knee. Hold briefly and return to starting position and repeat.